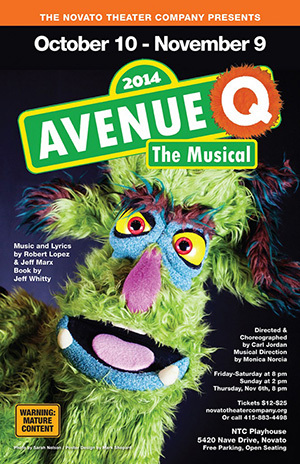 Avenue Q is an Tony award-winning Broadway musical comedy and coming-of-age story performed by humans and puppets. Drawing obvious inspiration from Sesame Street, it features young adults coming to terms with real-world problems, and coming to terms with life feeling less special than it did when they were kids. The subject matter is often risque, and while Avenue Q is a splendid showcase for the Novato Company Theater, it’s not a suitable show for children.